Two large coal plants announced for potential retirement by the Tennessee Valley Authority are operating with little to no financial margin, according to an analysis using S&P Global Market Intelligence's unit-level production cost model. TVA said on Aug. 22 that it is considering shuttering two of its six remaining coal-fired plants, as the power supplier undertakes an assessment of its generation fleet. The three- to six-month long study intended to determine whether its power plants are performing economically will initially focus on low-efficiency, high-cost assets, namely the Bull Run plant in Anderson County, Tenn., and the Paradise 3 unit in Muhlenberg County, Ky.
Bull Run is an 872-MW single-unit facility that began service in 1967. It had a net generation of 2,911,037 MWh in 2017, with a capacity factor, the percentage of hours it operated out of all possible hours, of 38.11%. Paradise unit 3, which entered service in 1970, is the only operating unit remaining at the Paradise plant site. It has an operating capacity of 1,017 MW and generated 2,293,293 MWh in 2017, for a capacity factor of 25.74%. Two other units at the Paradise plant were retired in 2017. Operations and maintenance, or O&M, expenses exceed wholesale power prices for the Bull Run facility, while operating costs and power pricing largely run close to each other for Paradise 3. 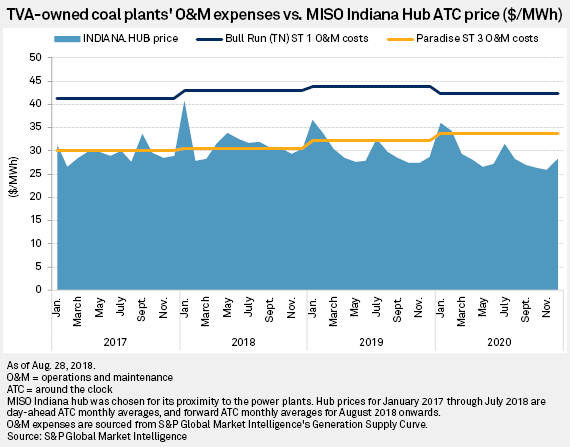 Around-the-clock day-ahead market price at the Midcontinent ISO's Indiana hub averaged $29.36/MWh in 2017, while O&M costs averaged at $41.22/MWh for Bull Run and $30.06/MWh for Paradise 3, according to the S&P Global Market Intelligence analysis. Similar trends are expected to persist into 2020. TVA President and CEO Bill Johnson in August cited a "mismatch" between the company's energy supply and customer demand as the rationale for the fleet evaluation. Despite population growth, electricity demand in the TVA region continues to decline due to customer conservation and efficient devices, he said. Some of the federal government-owned power supplier's combustion-turbine gas-fired plants are also in the underperforming category, according to Johnson. 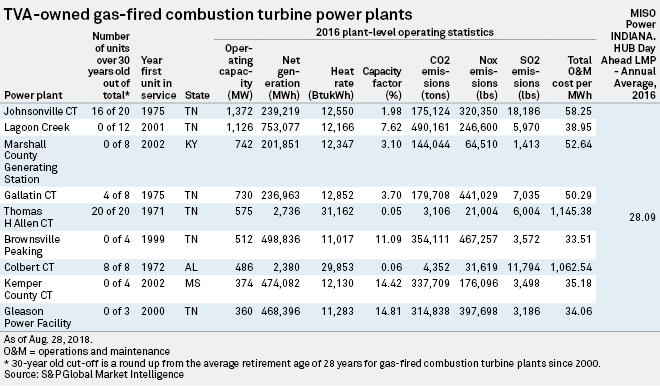 TVA currently has nine gas-fired combustion-turbine plants, ranging from the 360-MW Gleason Power Facility in Weakley County, Tenn., to the 1,372-MW Johnsonville CT in Humphreys County, Tenn. Among TVA's combustion-turbine gas fleet, the 575-MW, 20-unit Thomas H. Allen CT is the oldest, as well as the least efficient and profitable. Put online in 1971, that facility had the lowest 2016 capacity factor, 0.05%, as it generated 2,736 MWh, and the highest O&M cost, $1,145.38/MWh against the average MISO Indiana hub day-ahead around-the-clock price for 2016 of $28.09/MWh. Behind the Allen CT facility is the Colbert CT plant, which entered service in 1972. Comprised of eight units with a combined operating capacity of 486 MW, Colbert had a capacity factor of 0.06% in 2016 as it generated 2,380 MWh and an O&M cost of $1,062.54/MWh. Did you appreciate this analysis? Click here to turn on alerts for future power Data Dispatches.